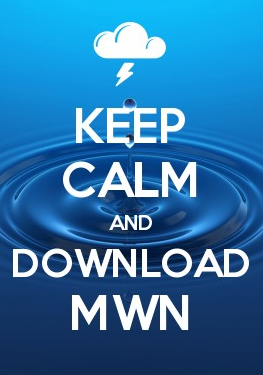 MWN Blog: Hang on! Weather for the next week could get a little crazy! Hang on! Weather for the next week could get a little crazy! After some much-needed (and appreciated) time off the past couple few days, it's back in the saddle for what looks like a wild ride the next 7-10 days! We'll start with tomorrow, when the AutoZone Liberty Bowl will be played before a large crowd at Liberty Bowl Memorial Stadium. 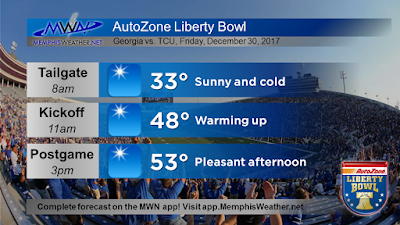 Welcome to Memphis to all fans of the Georgia Bulldogs and TCU Horned Frogs! The weather will definitely cooperate, starting with a chilly early morning tailgate but warming to near seasonal levels by early afternoon. With full sunshine and a light breeze, it should make for ideal conditions for a great game! Things take a turn downhill heading into Saturday as light rain begins in the early morning hours and continues throughout the day as scattered to widespread showers. Very little, if any, thunder is expected, but it will be a damp day with temperatures rising from near 40° in the morning to near 50° in the afternoon and a steady south wind of 10-15 mph and occasional gusts. Rainfall totals will not be excessive, but a half inch could fall during the day with light rain. We'll ring in 2017 with continuing cool, damp conditions as temperatures hold near 50° overnight. If you have plans to watch the guitar drop on Beale, plan appropriately. Thanks to continuing southerly wind on the first day of 2017, temperatures will be mild Sunday and rain chances will be lower. However, a few rain showers are still possible as a warm front lifts to our north, allowing temperatures to warm well above normal to start January - into the lower 60s - but also setting the stage for Monday when we will see our first strong storm system of the new year move through. 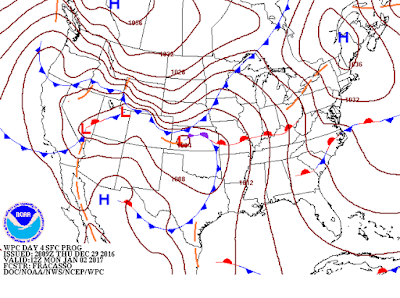 Monday - strong to severe storms? As warm and unseasonably humid air air continues moving north across the Mid-South Sunday night into Monday, an area of low pressure will move by to our west. In the warm sector of the low, over our region, the stage will be set for thunderstorms. With warm, moist air in place (characterized by highs well into the 60s and dewpoints of 60°+) and increasing wind and wind shear aloft as a strong front approaches, a few of the storms could be strong to possibly severe. Timing can't be pinpointed right now, but I would expect the afternoon and early evening hours will be the most likely time for any strong storms that form, as the front moves through probably during the evening hours. Given moderately strong wind fields and available instability, but forecast marginal lapse rates, it appears that damaging wind and a few tornadoes would be the main threats, with some hail also possible. We have time to narrow down the details, and there are still limiting factors as well, but for now there is a possibility that you'll need to be weather aware on Monday. Periods of heavy rain will also be expected, which could result in flash flooding. Expect more details this weekend in the form of an updated blog. 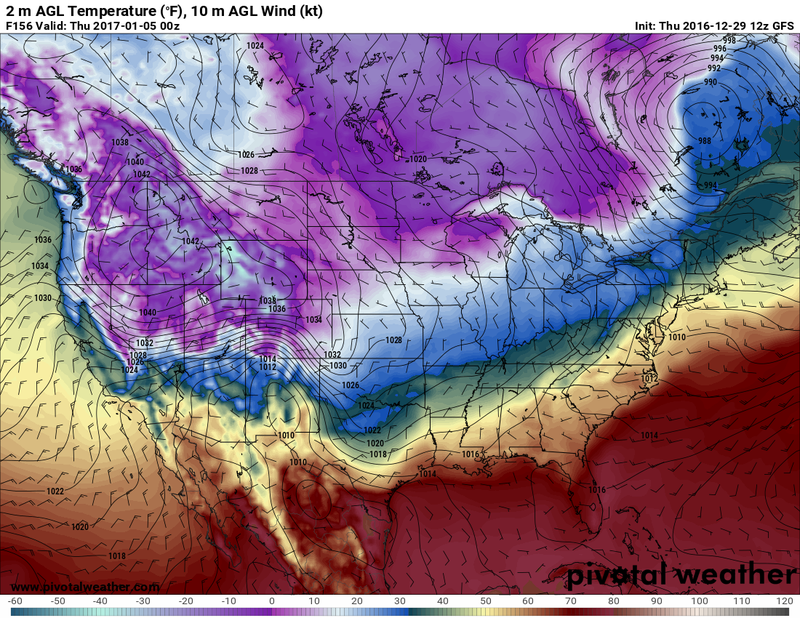 Another in-between day is expected Tuesday as the Monday system departs and Arctic air making a dive across the Plains doesn't yet arrive. Rain chances appear low with mild temperatures that could actually be well above normal again - likely in the 60s for highs. On Wednesday, you'll have been hearing about another Arctic blast that will have moved across over half of the country from the west coast through the Plains. 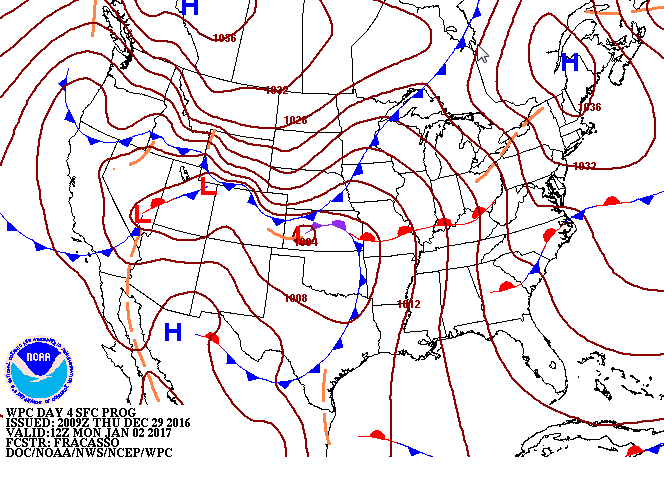 You'll start to feel it by mid-week as the front escorting said airmass arrives. Though morning lows will be a bit above early January levels, there won't be much of a warm-up as highs remain in the 40s, or about 20° colder than the first couple days of the week! Add in a cold north wind and it'll feel like winter arrived (again)! Very little precipitation is currently forecast with the passage of the Arctic front, though a few rain showers are certainly possible given the strength of the front and collision of the warmer air in place with the Canadian-bred airmass arriving. Thursday/Friday - "mischief" in the air? With Arctic high pressure sprawled across the northern half of the U.S. by the end of the week, the storm track shifts to the southern U.S. If you've been around the Mid-South a few winters, you know this storm track is one that can bring some winter weather "mischief" to the region. Details at 7-8 days out are very sketchy based on the trends of long-range models, but one thing is certain: it'll be cold! Highs in the 30s are expected to end the first week of 2017. Those long-range models, like the American GFS and European, do show the presence of upper level waves that push across the southern U.S., which could result in the formation of surface low pressure. If that happens, a southern stream winter storm could bring a chance of a wintry mix or snow to the Mid-South. We aren't forecasting any major storms at this point, but the presence of cold air and waves of energy prompted the inclusion of a chance of rain/snow in the MWN Forecast for next Thursday and, if trends hold, it could be added to the Friday forecast when we add that day as well. Stay tuned! 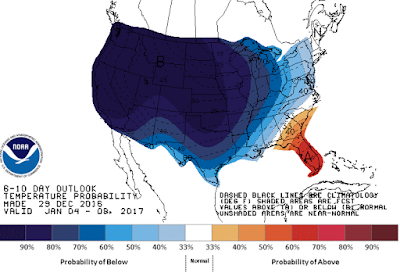 We could be in for the first round of winter weather a week from now! But first, be sure you stay weather aware over the next 4 days or so as the weather turns wacky as we hit 2017!